I could not cheer up a friend of mine yesterday when we walked down Republic Street and he was saddened because so few had come. In the company of hundreds one should feel emboldened. A demonstration like that in any city would command respect and attention. 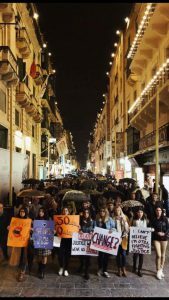 But here in Malta we are used to huddled crowds mobilised by political parties in a frenzy of enthusiasm and any public manifestation feels like a disappointment. I had one of those moments where I only thought when it was too late of what I should have said to him. But I know he’s reading this. Look at how Joseph Muscat must be feeling now. 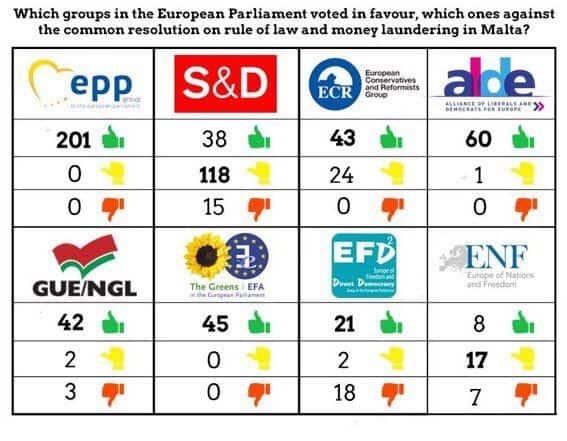 Here’s a summary by political party of how MEPs voted in the European Parliament in a motion admonishing him severely for effectively jumping of the European ship and taking us down with him. European People’s Party (of which the PN is a member). 100% in favour, no abstention, no votes against. Joseph Muscat would have expected no better. Socialists & Democrats (of which Malta’s Labour Party is a member). 22% in favour, 69% abstaining, 9% against. Those against include 3 Maltese Labour MEPs. The other 12 must be kicking themselves in embarrassment right now. The abstentions include the leader of the Socialists in the EP who could not bring himself to support Joseph Muscat. European Conservatives and Reformists Group. That’s British Tories and sundry euro-sceptics. 64% in favour. The rest abstained. None against. Alliance of Liberals and Democrats for Europe. All but 1 in favour. The 1 abstained. European United Left – Nordic Green Left. That’s inveterate communists between friends. 89% in favour and the rest split between abstainers and naysayers. The Greens. 100% in favour. European Freedom and Direct Democracy. Nigel Farage’s lot with sundry eurosceptics, proto-fascists, populists and neo-Nazi apologists. Here Joseph Muscat has enough friends to book the large table at Pizza Hut. 44% of them backed him. The rest voted against him or abstained. Europe of Nations and Freedoms. Extremists so far to the right they think EFD2 is too moderate. Lepenists, Lega Nord, and people who originally hailed from Nigel Farage’s and Germany’s black parties and found them too soft. Here too, Joseph Muscat could put together a 5-a-side team. 22% backed Joseph Muscat. About as many voted in favour of the motion and the rest abstained. We may have been few walking down Republic Street yesterday. It got a bit awkward when a couple of thugs stretched out of the Labour Party club balcony to shout out insults at the silent marchers. That would have made the news in the rest of the world. But this, as someone once said, is no normal democracy. But at least those marching yesterday had the comfort of belonging to the political consensus of Europe. I don’t want to read too much in the body language. But this is the first time Joseph Muscat met Jean Claude Juncker since that disastrous vote this week. Look at this photo. Does it look to you like Juncker would rather be chewing broken glass than be in that photo? 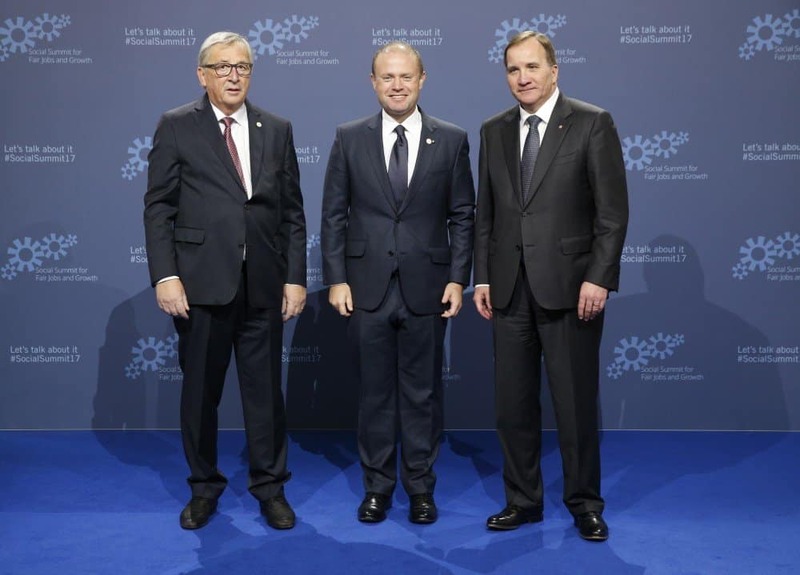 The messed up jacket on Juncker is partly due to the unwanted bear-hug Joseph Muscat had just subjected him to. Scroll to the bottom of this TVM report and watch the awkward greeting. I’ve seen more convincing hugs at pre-fight press conferences on the eve of exhibition boxing matches.